Everything in the body has a circuit it runs. That’s what makes the body such an efficient machine; it’s an actual machine. From the air we breathe to the blood in our veins and beyond, all the body’s systems are all circuits, with stopping points, entry points, and transfer stations. 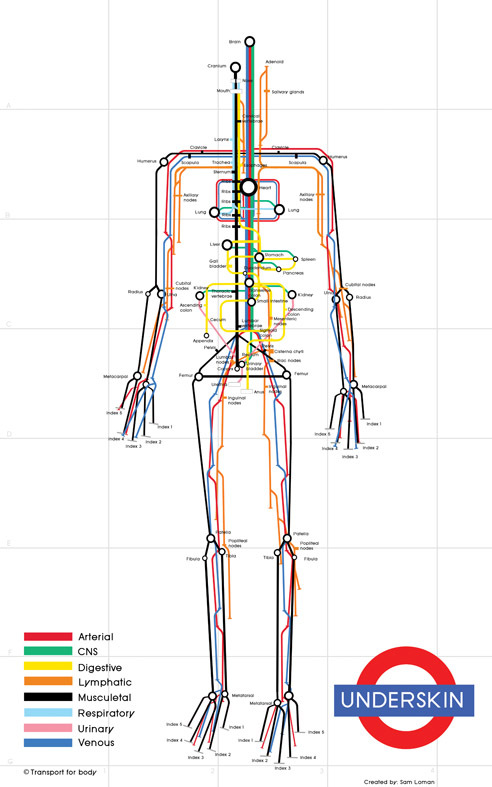 That’s what makes Underskin, a brilliant map of the body’s circulatory system from artist Sam Loman, so brilliant. It turns a very difficult concept into something anyone with a passing familiarity with a subway map can follow along, without succumbing to morbidity. When I was in college, I had to learn these various body systems. In my case, it was merely the central nervous system and some of the musculetal system. I was spared the full rote memorization most people have to undergo, which is great because I hate rote memorization of stuff I won’t really ever need again. That’s for premed students, not kids taking Biology 101.